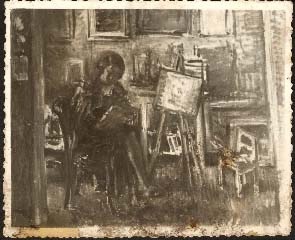 Photograph of a lost painting showing the studio of the painter Izrael Lejzerowicz. The woman is possibly the artist’s sister, Chaja/Hela. The date is unknown – possibly pre-war. On the reverse, in pencil, the indication an address: “Piwna 35 parterze u pani Cesi [Zylb...? ].” Yad Vashem Photo Archives, 7950/17. Gift of Tobias Rozynès, Lyon, via Gérard Mayer.